What’s behind Mary devotions in May? For Catholics, May crownings, rosary processions, even Mary gardens are traditionally part and parcel for the fifth month of the year. The practices are centuries old, but they are relevant for Catholics today, said Maria Cocchiaro, director of youth and young adult ministry at St. Mary in Hagerstown. St. Mary parish and school in Hagerstown plans an annual May crowning, a tradition where a young girl places a crown of flowers on a Mary statue at the beginning of the month. St. Mary’s crowning includes a procession. Later in the month, the parish hosts a rosary walk through downtown Hagerstown. Some parishioners may begin or renew a consecration to Mary, a personal dedication to live in union with Jesus through the intercession of his mother. Heightened religious devotion in May dates to the Middle Ages, although Mary wasn’t the month’s initial focus. According to the International Marian Research Institute at the University of Dayton, Ohio, the custom began as a devotion to the cross with prayers for a bountiful harvest – particularly that the spring blossoms would mature into fruit. Although the devotion had some public expressions, it was primarily for Catholics’ homes. In the 18th century, a wave of Marian devotion spread across Europe, and Catholics piously connected the May devotion’s blossoms to traditional symbols for Mary, such as the rose and lily. The devotion claimed a stronger connection to liturgy, and was bolstered by the dogmatization of Mary’s Immaculate Conception in 1854. 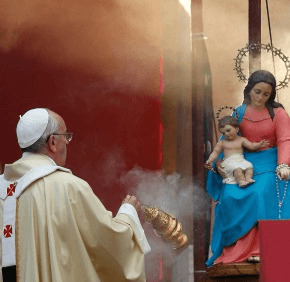 In the early 20th century, popes called the faithful, especially children, to Marian devotion in May, and churches became devotional hubs during the month. Families, meanwhile, continued to practice devotions in their homes. The emphasis on May devotions waned after the Second Vatican Council, but in recent years, Catholic parishes, schools and families have shown renewed interest, according to the IMRI. May celebrations – both religious and secular – point to the importance of family, including the Holy Family, Cocchiaro said. Fifty years ago, Mount St. Mary’s University in Emmitsburg chose May for the dedication of its iconic bell tower topped by a 25-foot, gold-leafed bronze statue of Mary. The National Shrine Grotto of Lourdes is hosting an anniversary Mass and blessing of the Pangborn Memorial Campanile May 4. “We’re all looking for guidance on how we can be close to Jesus, and as a mother, she’s the one who educates us and drives us on our journey,” she said.